The single arm reverse fly is a beginner exercise that targets the posterior deltoid. This exercise is suitable for any fitness level. The single arm cable extension is a beginner exercise that targets the triceps and is suitable for any fitness level. 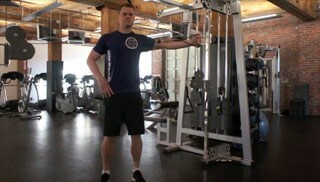 This is an intermediate exercise that uses the cable machine to train the core and chest.